"जो दृढ राखै धर्म को, तिहीं राखै करतार"
It is believed that the slogan Jo dridh rakhe dharm ne, tahi rakhe kartar was spoken by Abdur Rahim Khankhana, who is also known as "Rahim das" in Hindi poetry. 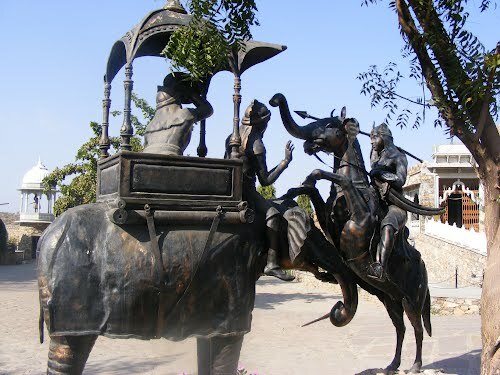 About Maharana Pratap: Maharana Pratap (May 9, 1540-January 29, 1597) was a ruler of Mewar, a state in north-western India. He belonged to the Sisodia clan of Suryavanshi Rajputs. The epitome of fiery Rajput pride and self-respect, Pratap has for centuries exemplified the qualities that Rajputs aspire to. Pratap, eldest of 25 brothers and 20 sisters, was born at Kumbhalgarh on Sunday the May 9, 1540 to Maharana Udai Singh II and Maharani Javanta Bai Songara (Chauhan). Polygamy and maximum children were social necessity of the period owing to higher female population and high battle casualties. Rana Pratap had 17 sons and five daughters. The male-line descendants of Udai Singh II bear the patronymic "Ranawat". Maharana Pratap was Born in Pali-Marwar. His birth place known as Juni Kacheri.